When Fido or Fluffy appear ill or behave strangely, pet owners wonder whether to rush to an emergency clinic or wait to see how the animal fares. But there's a new way to decide whether a pricey, time-consuming trip to a pet ER is warranted, thanks to technology created for humans: telemedicine, which connects doctors with patients via smartphones and tablets, two-way video, email and other methods. Several companies recently launched smartphone apps and websites offering pet owners live texting or video chats with a licensed veterinarian, online databases covering pet illnesses, behavior and nutrition and other help. They have veterinarians on standby 24/7. There's a big market for such services. About two-thirds of U.S. households have one or more pets. And the American Pet Products Association estimates pet owners will spend an average of $786 for veterinary care for their dogs and $594 for cats this year. The services' online advice costs anywhere from a few dollars for a short text conversation to $40 for a live chat that includes sharing photos or video of the sick pet. Most have apps for iPhones and Android devices, plus web sites that explain their services, give bios of their vets and have searchable questions and answers from previous consultations. They're easier to search and bring more reliable info than "Dr. Google," the companies say. Veterinary regulations vary by state, but most prohibit diagnosing and prescribing treatment unless the veterinarian has physically examined the pet previously. So the services offer basic info and advice—though some hope regulations will change, allowing them to do more in the future. The virtual consultations these services offer may just reassure pet owners—or help save a dying pet. 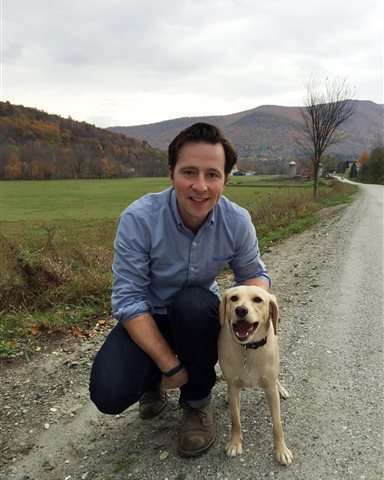 James O'Connor of Charlestown, Massachusetts, turned to www.kuddly.co in September when his 2-year-old Labrador/beagle mix, Charlie, had persistent diarrhea. It didn't stop after three $85 visits to his regular veterinarian, who kept selling him prescription dog food to change Charlie's diet. O'Connor got a $3 "second opinion" via Kuddly's app from a vet specializing in gastrointestinal disorders. The vet said Charlie appeared to have irritable bowel syndrome and switched Charlie from chicken-based dog food to salmon. Charlie's doing well now. "This is where I'm going the next time I have a question," O'Connor said of Kuddly, which launched in July and has more than 150 veterinarians. They set their own prices and offer help via email or live chats in its app. Kimberly Smith of Hubbard, Texas, credits Vet on Demand with saving her 6-year-old Havanese, Betty. The service, which was launched in June, offers video chats for $25 apiece or monthly subscriptions for $14.95 for one pet and $29.95 for multiple pets. Vetondemand.com, which has nearly 50 vets, keeps consultation information in an electronic record for follow-up chats. Smith tried it after her dog was stolen from her yard and mysteriously returned, nearly dead, in February. With her vet 75 minutes away, Smith was "desperate." She did a $5 video chat via Vet on Demand that allowed its veterinarian to see Betty's condition, including white gums that indicated internal bleeding. The vet instructed her to feed Betty Pedialite through a turkey baster while a relative drove them to their regular vet's hospital. The dog had eaten rat poison and needed blood transfusions and other treatment over the two weeks she recovered there. "Now she's back to her old self," Smith said. Most of these businesses are rapidly expanding, adding more veterinarians, nutritionists and other experts and sometimes additional services. One service, Vet24Seven of Santa Clara, California, launched in July at www.vet24seven.com. It lets vets set their fees, usually around $40 for a 10- to 15-minute video chat. It answers questions texted via its app for free and offers live chats with hundreds of veterinarians. It recently added $75 "PetCheck" home examinations for urgent care in 20 California cities and will expand nationally in 2016. Veterinarian Christie Long said vets benefit from the services by earning extra money and sometimes gaining new clients, while pet owners get affordable access to experts. Long works with Pet Coach, a service with more than 75 vets and 150,000 users. It lets people post brief questions for free, charges $19.99 for online chats and sending photos of a sick pet, and early next year plans to add video chatting. Its site, www.petcoach.co , also lists more than 100,000 questions and answers.